The information below is just one delectable slice of the most recent statistics pie on offer at authorearnings.com. We encourage you to read the entire author earnings report here: authorearnings.com/report/february-2016-author-earnings-report. Have an opinion on the newest statistics? Share it with us in your comment below! 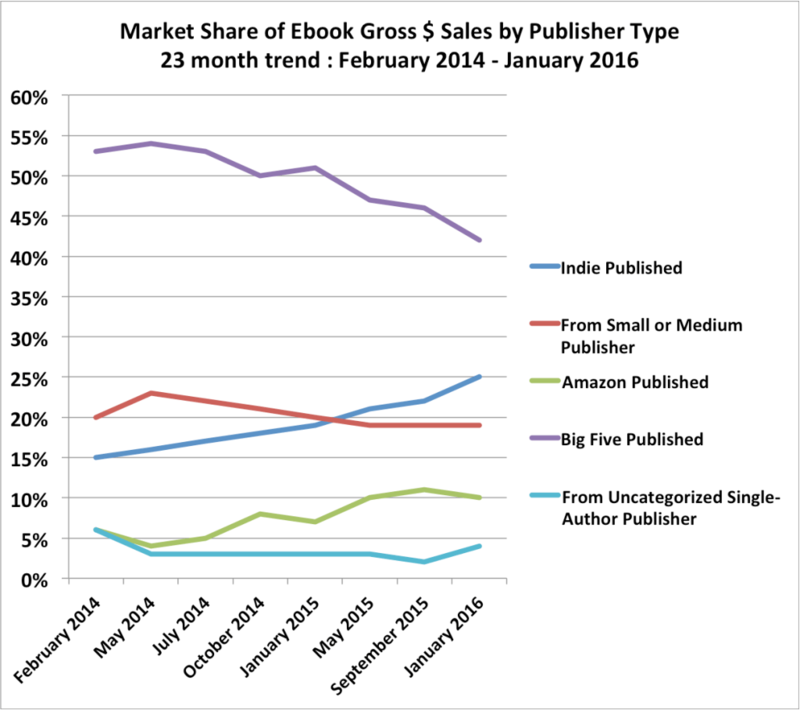 Two years ago, the first Author Earnings report revealed the growing market share of self-published ebooks. With data on hundreds of thousands of titles, it was suddenly possible to measure the relative sales and earnings power of ebooks according to publishing path. By sharing this data, the researchers at authorearnings.com hoped to help authors understand the changing market in order to make sound decisions with their manuscripts. In the two years since, quarterly snapshots have revealed emerging trends in the digital publishing world. Here’s a look at those trends, with the new February 2016 data points included. 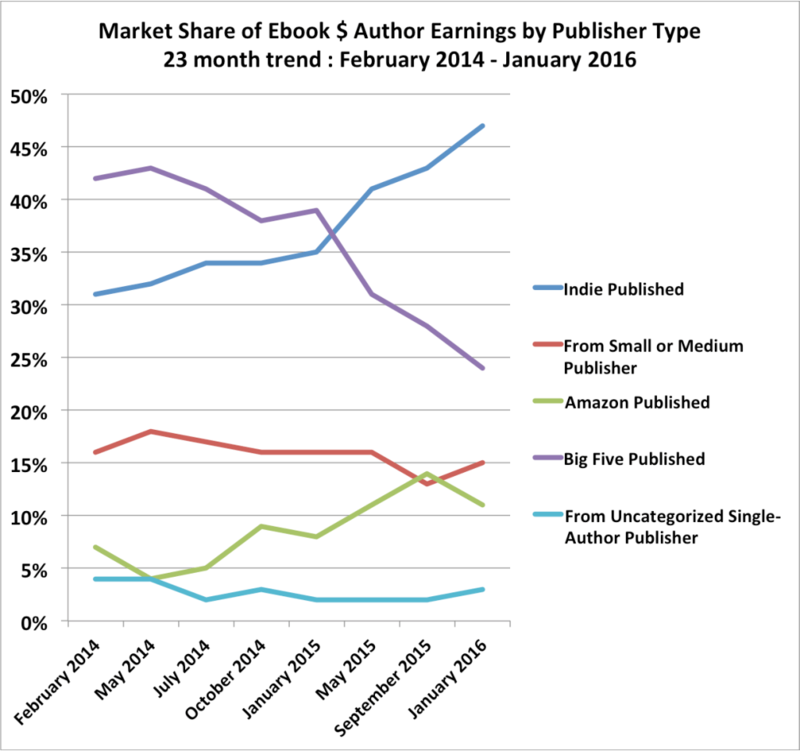 The most important graph for authors shows the rapidly diverging rate of ebook author income by publishing path. The Big 5 publishers are now providing less than a quarter of the dollars earned by creatives for their ebook sales. Indies are taking close to half. 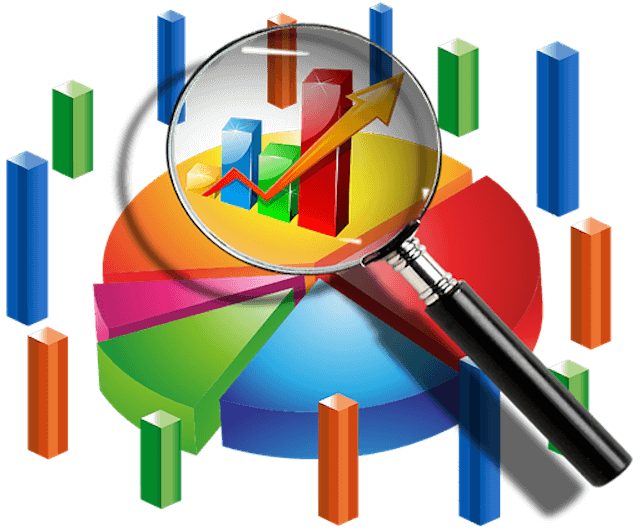 For a deeper dive into this month’s report, including details about the new and improved sales-to-rank curves and methodology, we encourage you to read on HERE! 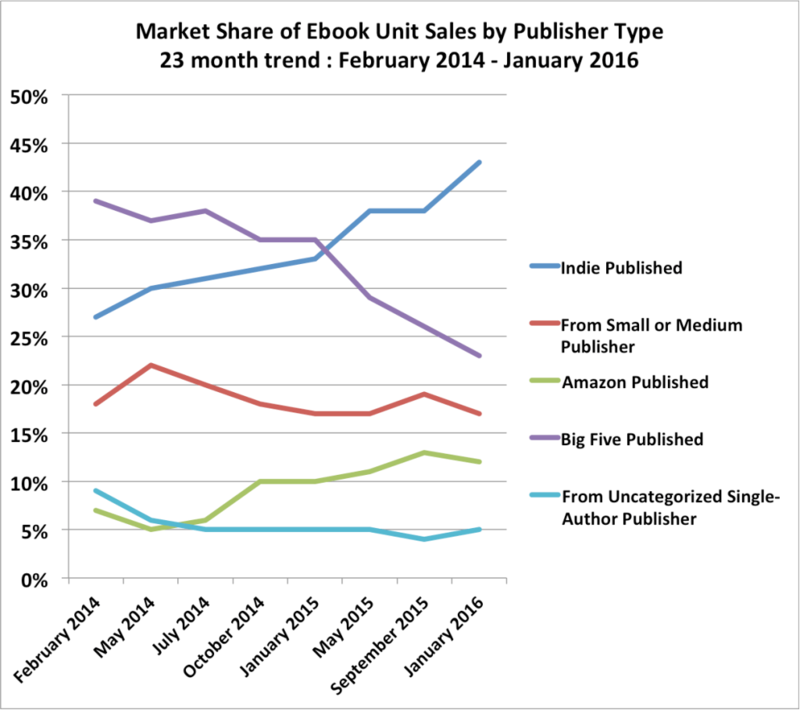 In 2016, the reach of indie self-published authors isn’t limited by any means to ebooks. Every indie author should seriously consider releasing print-on-demand paperback editions and — as soon as quality narration can be afforded or arranged — audiobook editions of their books. It’s also critical to note that 2015 marked a tipping point of sorts for online retail, with some reports claiming that fully half of online sales gains took place on Amazon.com alone. Sales on Amazon.com overtook Walmart in-store sales for the first time. More and more, online is where shoppers are going. Independent authors have equal access to this storefront. 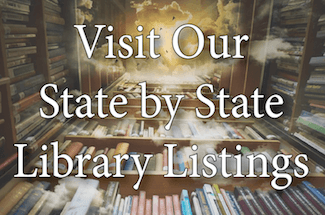 In fact, with lower prices, greater creative freedoms, the ability to publish to market much faster, and the ability to appeal to a wider variety of readers, indie authors have huge advantages online.